Purpose – The purpose of this article is to discuss the collaborative learning outcomes-based approach taken by a librarian and disciplinary faculty members to improve information literacy (IL) curriculum within disciplinary courses. To this end, the team aimed to award badges to certify IL skills. Design/methodology/approach – This article considers relevant literature on competency-based curriculum, technological innovation in higher education, collaboration between library and disciplinary faculty and badges. This literature is used to frame the approach to plan a successful and sustainable project to embed IL in disciplinary curriculum using digital badges. The approach includes mapping learning outcomes and engaging in instructional design tasks – including planning for content delivery and student assessment. Findings – An approach to technological innovation for instructional projects based on the principles of pedagogical design can result in improvements to IL pedagogy and collaboration between librarians and disciplinary faculty, whether or not a technological implementation is successful. Practical implications – Librarians and disciplinary faculty can take a pedagogical and learning outcomes-based approach to embedding IL into disciplinary curricula. Further, despite administrative push for technological innovation, projects can succeed when focused on improvements to pedagogy rather than solely on the implementation of new technologies. Originality/value – Planning for and implementing badges for IL curriculum is in an incipient phase in higher education. 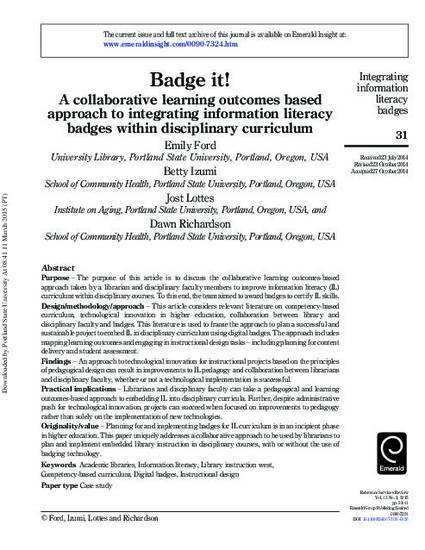 This paper uniquely addresses a collaborative approach to be used by librarians to plan and implement embedded library instruction in disciplinary courses, with or without the use of badging technology. The presentation associated with this article can be accessed at http://archives.pdx.edu/ds/psu/14547. This article is (c) Emerald Group Publishing and permission has been granted for this version to appear here (http://pdxscholar.library.pdx.edu/). Emerald does not grant permission for this article to be further copied/distributed or hosted elsewhere without the express permission from Emerald Group Publishing Limited.